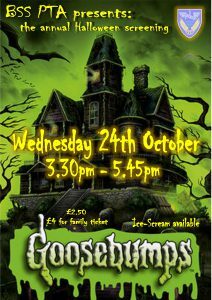 The PTA will host its Halloween screening of Goosebumps on Wednesday 24th October from 3.30 pm-5.45 pm. Tickets are £2.50 or £4.00 for a family ticket. Ice cream will be available on the evening.